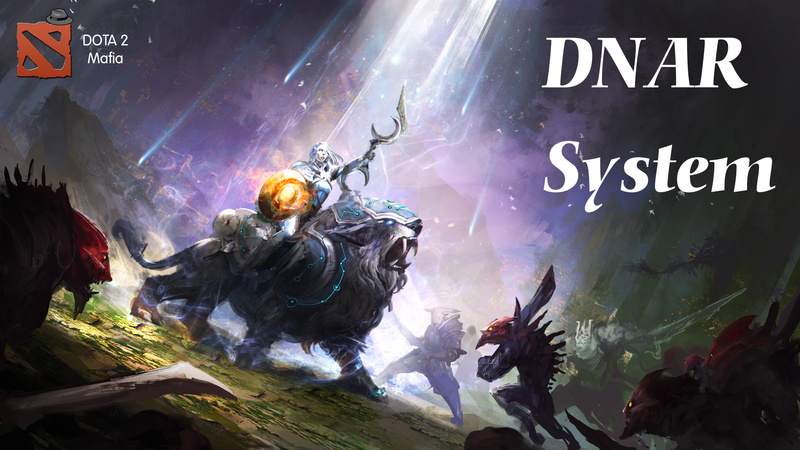 DNAR is DoTA Mafia Night and Twilights action resolving system. DNAR follows the golden rule of NAR system: Apply actions which modify other actions before the actions they modify. Sometimes the actions that might affect each other form a loop, so that there's no action to pick in step 1. In other cases, the order of two actions matters but it isn't clear that one affects the other. Player 1 blocks Player 2. Player 2 redirects Player 1 onto player 3. In this case, both actions affect each other; player 2's action changes the target of player 1's, while player 1 prevent player 2 from performing an action. Note that this loop would not occur if either of the players had chosen different targets. If player 2 had targeted someone else, then the roleblock is not affected by any other actions, and player 2 will just be blocked outright. If player 1 had targeted someone else, then the redirect is not affected by any other actions, so player 1 will end up blocking player 2's target. Player 2 gives an invention to Player 3. In this case, the order of applying the actions affects whether player 3 loses just the abilities they had at the start of the night, or whether they lose the invention as well. Again, there is no conflict if the players pick different targets; for instance, if player 1 targets player 2, then the gift of the invention has absolutely no effect on the vanillaising, so the vanillaising (which would prevent the invention being given with some variants of Vanillaiser) happens first. Only in case of emergency breakdown of the Golden Rule and if a paradox happens to use the following list of actions for priority. the actions at higher levels have more priority. the actions that are in left have more priority in their own bracket. This list ensures that DoTA mafia has no grey area in action resolving system but this must not be used unless if it's necessary. Killing doesn't stop the actions of the dead player. (Imagine that all kills happen at the end of the night, and everyone pulls the trigger simultaneously.) This means that kills generally do not affect other actions for the purpose of the Golden Rule. A reminder that this is the priority list of actions (that must be used if a conflict exists) not the order that actions should happen in most cases. DoTA mafia follows NAR golden rule and will only use this list in case of a conflict. Last edited by Frozen Angel on Wed Jan 02, 2019 5:04 pm, edited 18 times in total. Poison Touch [d][2c]: Your target will lose any extra main votes if they have any, for the rest of the day. Shallow Grave [n][8c]: Make someone lynch proof. If they get lynched during the next day, they will be removed from the game during the twilight but they will return to the game at the start of the next night phase. Shadow Wave [n][2c]: Heal the target from 1 kill attempts that night. The Shadow Wave has 50% chance to bounce to another player each time. Weave [u][n][2c]: Remove all Heals and Kill effect blockers from the opposing clan. If you cast Shallow Grave on a person from your clan when Waeve is casted, the Shallow Grave won’t go on cooldown. 25 Shallow Grave Cooldown reduces to 2 cycles. Weave will remove the primary attributes from all members of the opposing clan that night. 20 Get one point of Strength. Get one point of Agility. 15 Poison Touch cooldown reduces to 1. Shadow Wave bounch chance increases to 60%. 10 Gets one extra point of Intelligence. Gets 7+ farming votes per day. Notes Poison Touch removes all extra votes that are attached to someone's main vote immediately. Poison Touch effect will last till the end of the day (they won't be able to get extra votes attached to the main vote). Shallow Grave is usable in night phases to save someone from getting lynched during next day phase. Shadow Wave has a 50% chance to heal another random (who has not being healed with Shadow Wave already) person as well every time it heals someone. 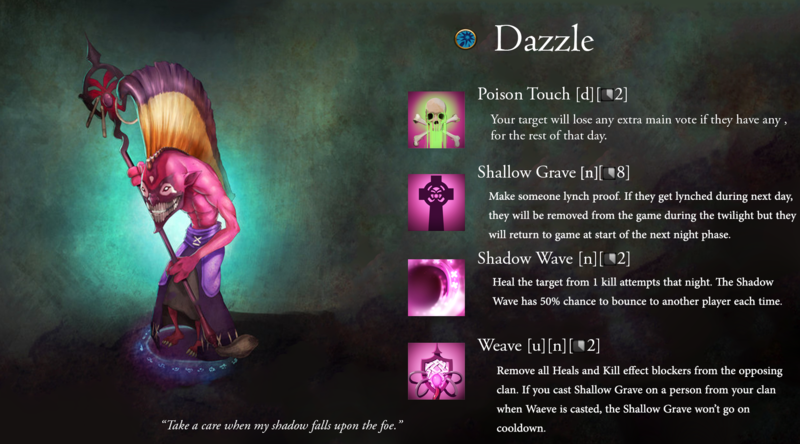 With a VERY lucky Shadow Wave, dazzle can heal all the living players. - On opposing clan: It disables all heals and Kill effect blockers, meaning it will ensure the kills to go through. - On Dazzle clan: If dazzle uses Shallow Grave on any member of his clan that night, his Shallow grave won't go on cooldown. This means dazzle will be able to use multiple shallow graves in the same night if he has more intelligence points. Because of the effects of an ability which was casted on you, you lost all the extra votes attached to your main vote for the rest of this day phase. This data is unavailable currently. [Player Name] is magically alive again! Please welcome them to the game. Talent 15-right: Chance of bouncing is reduced to 60% from the previous 70%. Talent 25-left: Is now changed to "Shallow Grave Cooldown reduces to 2 cycles." Talent 25-right: Is now changed to "Weave will remove the primary attributes from all members of the opposing clan that night." Talent 10-left and 15-right are swapped. Talent 25-right: Is now changed to "Luna extra votes will bounce with her main vote." Heroes Crystal Maiden, Wraith King, Bounty Hunter, Dazzle and Luna are included in DNAR. - IO notes were updated to clarify things about their abilities. Talent 15-right: Is now "You can disable and enable Precision Aura effect on will." Heroes Lina, Earthshaker, Disruptor, Phantom Assassin, Dragon Knight, Techies, IO and Drow Ranger are included in DNAR. Crystal Nova [d & n][1c]: Delay all the actions casted by a single player for a full cycle. Frostbite [n][1c]: Block the targeted player actions that night. Won't block the factional kill and redirecting abilities. Arcane Area [p]: Motivate all the players in your clan and yourself allowing you all to perform one extra action per cycle. Freezing Field [u][n][4c]: As a channeling ability, delay all the abilities in the next night phase after this ability is casted for a full cycle and Role Block everyone in the opposing clan during the third cycle. 25 Freezing Field will Role Block everyone even if they are in your clan. Arcane Area's effect will be duplicated. 20 Get one point of Agility. Get one point of Strength. 15 Get +7 farm point votes at start of each day phase. Get one extra point of Intelligence. 10 Crystal Nova will effect everyone who were targeting your target too. Frostbite will effect the Redirecting abilities and the Factional Kill. Notes If Crystal Nova is casted in a day phase, all the day actions ability that player cast in the rest of day phase will effect at the start of next day phase. If it's casted at night phase, all night action abilities will get delayed. Crystal Nova delay is an Effect delay, not an action delay. This means the actions that are getting delayed will be processed in the same phase that they are being casted but their effect will happen in the next phase. If a day action is getting delayed the effect will happen at the start of the next day phase. Arcane Area will start effecting starting of the next cycle (for example if you learn it during day 2 it will start effecting starting day 3 and if you learn it at the game start it starts working starting day 1). The effect of Arcane Area removes if Crystal maiden dies (Bounding). When Freezing Field is activated in night n, all abilities that are casted in night n+1 will be effectively delayed and their effects will happen at night n+2 (like crystal nova on all players) and everyone from the opposing clan will be blocked during cycle n+2 (meaning their last night abilities will work but they can't cast new abilities during the day, twilight or night). Canceling the channeling ability will not remove the effects of the delayed actions if the delay is processed. You may perform an extra action per cycle. You may perform two extra actions per cycle. Crypt Swarm [n][1c]: Sends a swarm of winged beasts toward someone. If they die that night or during the next day you will absorb their soul. Silence [d&n][2c]: The person you're targeting can't case any abilities during the next phase. Spirit Siphon [t][1c]: Absorb the most recent dead player's soul. You will have a neighborhood chat with all the dead players you absorbed their soul and you will need one more vote to get lynched for each one of them. They can end this and free their soul whenever they want. Exorcism [u][d][2c]: Force all the souls who are obeying you to rise and vote after you. This effect must be public and won't lynch. 25 Exorcism cooldown reduces to 0 cycles. Spirit Siphon cooldown is reduced to 0 cycles and it can be used in all phases. 20 Get one point of Intelligence. Crypt Swarm will put one invisble vote on the target. 15 Get +3 farm point votes at start of each day phase. Get one point of Strength. 10 Spirit Siphon can be used during the day phases. Silence can be used during twilight as well. Notes By absorbing souls she is making an army of dead - making herself stronger - and she can continue to chat with the players who are gone. The dead may end this effect and release their sole. If that's the lynch state, C will be putten in L1 instead. Obviously, dead players won't join any dead threads until they release their souls. A resurrection effect will stop it from taking place. Each absorbed soul topic is unique and completely separate from the rest. The dead souls will be released and Exorcism effect will stop if Death Prophet dies. You died but your soul is absorbed by the [player name]. You have a private topic with them in [link] which you can use anytime you want. You may release your soul anytime you wish. You lost access to one of your private topics. Because of the effects of an ability which was casted on you, you won't be able to use any abilities during this [Phase] phase. You heard the voice of death once again. "A blow to the very foundations of life!" 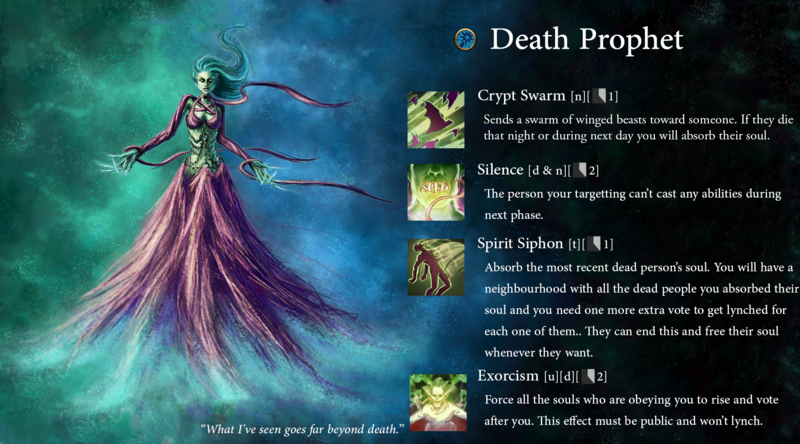 - Death prophet was added. 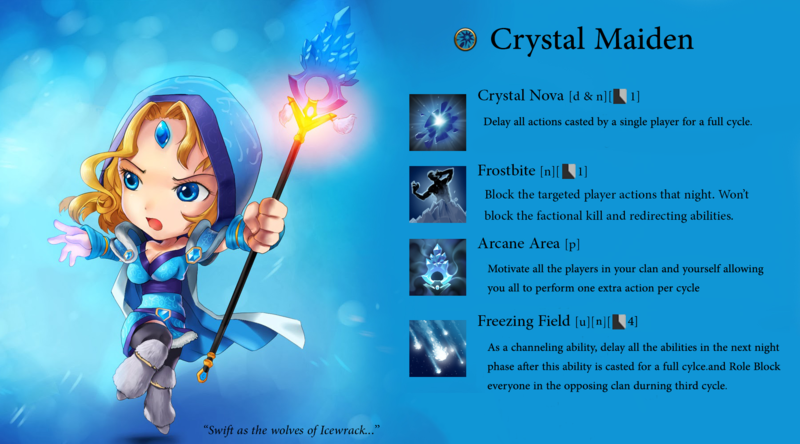 - Crystal Maiden notes were updated to clarify Crystal Nova and Freezing Field delay effects. Heroes Templar Assassin, Axe and Death Prophet are now included in DNAR. Overwhelming Odds [n][2c]: Turn the enemies numbers against them. Add 10% of the needed vote for a lynch rounded down for each one of the people who is visiting you to a random person who visited you. Press the Attack [d][2c]: Double the voting power of you or one of your clan-mates for the day. Moment of Courage [p]: If you vote someone who is voting you (with their normal vote), you will force them to unvote. Duel [u][d][1c]: Gladiate yourself with someone else. No lynch is not allowed. One of the two must die at the end of the day. In case of a tie you will win the duel. Whoever wins the duel will receive an extra vote stuck to their main vote for the rest of the game. 25 Press the Attack cooldown reduces to 1 cycle. When you Duel you will automatically add 1 annonymous vote to your target. 20 Moment of Courage will force your voter to vote themselves. Get one point of Agility. 15 Overwhelming Odds will know add 20% of the required votes for each visitor instead of 10%. Get one extre vote sticked to your main vote. 10 50% faster level ups with farming points. Get one extra point of Strength. Notes Overwhelming Odds will add 10% (with the 15-1 talent 20%) of the required votes to lynch with majority * n where n is the number of people visiting legion commander to a random visitor of her. For example, if A, B, and C are visiting legion commander and 6 votes are required for a lynching in next day phase, 10*3 = 30% of 6 votes will be added randomly to one of the 3 visitors. This is 30%*6 = 1.8. Rounded down it will be one vote. That being said A, B and C each have a 33.3% chance to start the day phase with an anonymous vote (marked as ?). Press the Attack effect will only remain till the start of the next night phase. Vote buffs will work in a way that first any "addition" will be added then the multiplier buffs will be multiplied. So if LC has +2 votes and her vote is doubled, she will have (1+2)*2 = 6 votes. Moment of courage will only work if LC is the one who is voting after. Duel is a channeling ability. This means it will be canceled if LC or her target dies for any other reasons. Plus LC is not allowed to cast any other abilities when she is in a duel. LC's target will also participate in this channeling ability and is not allowed to cast any abilities when they are in a duel. Duel prize (extra vote) is permanent. Duel can't get canceled with blocking LC or her target. Duel can be removed with a mass debuff effect. Your vote is doubled for this game phase. [Player Name] is dueling [Player Name]. Only one shall live out of this. You can only vote one of them. No lynch is not acceptable. The one who lives will receiev 1 permenant extra vote sticking to their main vote. Bothe players are busy in a channeling ability and will not be able to cast any new abilities. 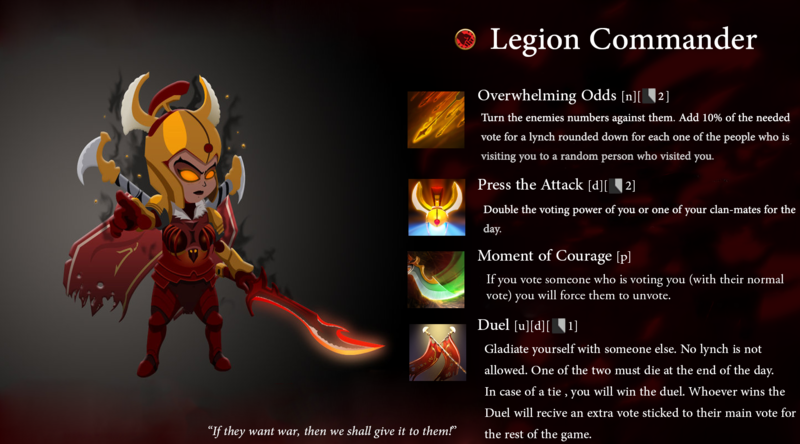 - Legion Commander was added. Jinada [p]: If Bounty Hunter kills anyone or be last one voting, they will steal all the farm votes target has. - Bounty Hunter's Talent 10-1 was updated. Jinada will apply to all the lynched players if Bounty hunter was on their wagons. Blur [p][n][1-Shot]: There is a chance (15%) for all the actions casted on you to fail. Phantom Assassin can disable that passive forever to become invisible from vote count for the next day. Hero Legion Commander is now included in DNAR. All reworked/changed abilities were updated in DNAR.